Join us at the Korumburra Station for another special event! After 25 years as a secondary college teacher in Australia in English and Humanities, Dianne 'retired' and set off for the United Arab Emirates with husband Peter, where they lived for 2 ½ years. Peter worked full-time and Dianne worked part-time in a girl's school where she also tutored some of her students mother's in English. Interestingly Dianne also volunteered in a hospital as a surrogate patient! During their time in UAE the pair lived in Al Ain in the Emirate of Abu Dhabi. Dianne and Peter have since spent 6 months in Africa, also to teach. Dianne will share with us some of her insights into life as a woman in the UAE and other life experiences. Our member, Lucy May Mertens of Lucy May's Café in Korumburra, will be catering for this great event. Look forward to catching up with you on the night. 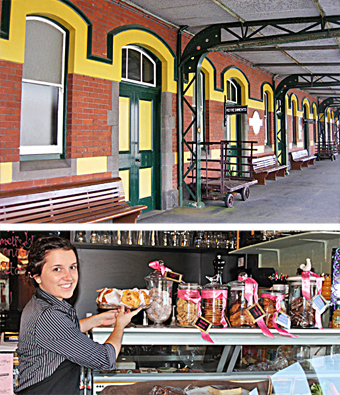 Top: Korumburra Station. Bottom: Lucy May Mertons.